Come along to our regular Coffee Morning and meet friends old and new. We regularly hold Whist Drives on Friday evenings, if you would like to come along and join the fun then please contact Pete Smith on 01889 567447 for further details. The Hall is available to hire, for further details or to make a booking please contact the bookings secretary joyce.salmon@googlemail.com 01283 820393. 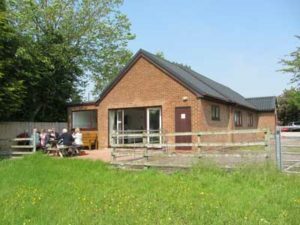 Situated in a tranquil rural setting, the Marchington Woodlands Village Hall was built in 1954 on land donated, by the beneficiaries of the Will of Mr William Martin. In the early years the hall was used extensively both by the Woodlands village school and by a number of very active organisations and societies. The village school is now closed; however, the hall remains a key asset for the village. The village hall and the church are the only remaining centres for communal activity in Marchington Woodlands. The hall is managed by a committee appointed by the local community and designated local organisations. The hall is reliant on grants, lettings income and income from village functions to finance its upkeep and any improvements. The hall has recently undergone a substantial renovation to modernise and improve the energy efficiency of all aspects of the facility. Recent improvements have included the redecoration of the main hall, the installation of a new kitchen and the creation of a separate bar area. The hall is fully accessible to disabled persons with all rooms on the ground floor. The available space comprises a large main room, a small stage, a separate kitchen area and toilets. Adjacent to the hall is a 1/2 acre field which is used for a variety of outdoor activities and functions. The hall enjoys beautiful views across the adjacent countryside which is a favourite area for ramblers and cyclists. The hall is available for hire for public and private functions and is licensed for dances for up to 120 people and for seated meals for up to 90 people. The hall and adjacent field are proving very popular as a country wedding location. Further details and prices are available on in the Facilities and Charges document.